Shut Down your Computer Automatically by Configuring Idle Minutes. Auto Shut Down your Computer easily with Turn Off Monitor Software Utility. Shut Down your Computer Automatically instead of keeping your Computer idle for several Minutes to Save Energy. 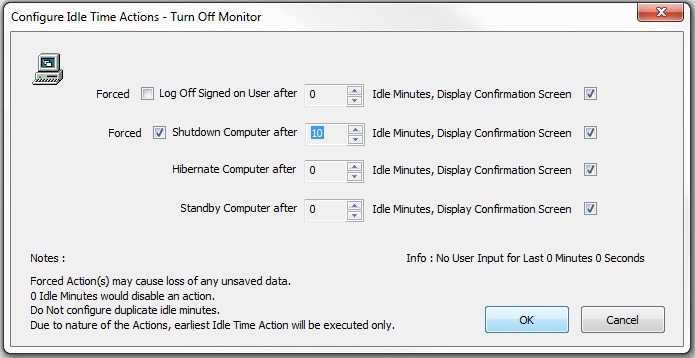 Download & Install Turn Off Monitor Software Utility. Launch Turn Off Monitor Software for the first time to get a System Tray Menu of Turn Off Monitor. Right Click on the Turn Off Monitor System Tray icon and Select Configure Computer Idle Actions. 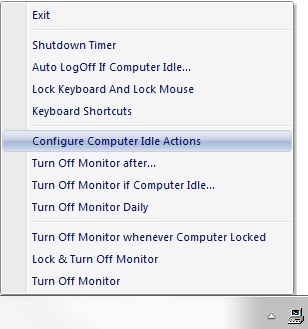 A small Window will appear named Configure Idle Time Actions. Mark Shut Down Computer and Enter the Minutes after how much Idle Minutes do you want to Shut Down your Computer Automatically. After Entering the Minutes if you want to Display Confirmation Screen before Shutting Down your Computer then Mark on idle Minutes, Display Confirmation Screen and press OK to Save Changes. Your Computer will Shut Down after several Specified Minutes when there is no Input on your Computer. If you Computer remains Idle more than Configured Minutes it will Automatically Shut Down your Computer with Force means any document if open will not be saved it will directly Close all open Application on your Computer.